Creamy Chicken Wild Rice Soup is one of our favorite soups to make, and to eat too! It’s a hearty and delicious soup that definitely be filed under the comfort food category. When dining at our favorite soup and salad place, I can hardly resist ordering Creamy Chicken Wild Rice Soup when it’s on the menu. It pretty much trumps any other soup, especially on a chilly day. 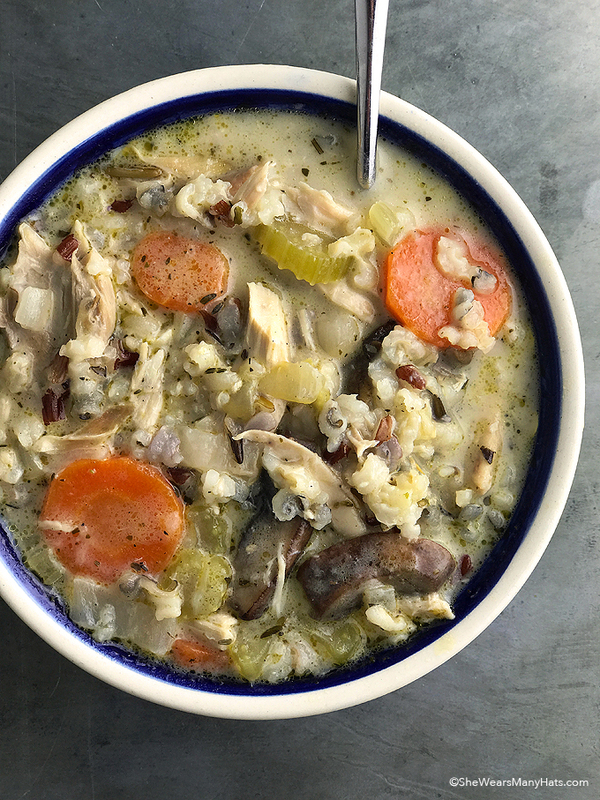 In addition to chicken and wild rice, this delicious hearty soup is packed with carrots, mushrooms, and a blend of herbs to create a satisfying bowl full of flavor. And it’s super easy to make. Perfect! With a lineup of simple ingredients, this Creamy Chicken Wild Rice Soup is easy to make and a great way to use leftovers. It’s also a perfect soup for a rotisserie chicken. 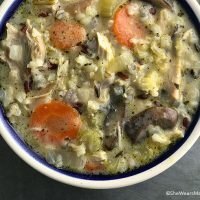 Not only is it easy, but this chicken and wild rice soup can be made ahead of time by a few days which makes it an excellent lunch option. Make a batch early in the week and rewarm a small bit for a quick, yet delicious meal. As I mentioned, this recipe is easy soup fixing! Begin by heating oil in a large stockpot. Add diced onion, sliced carrots, celery, mushrooms, garlic, thyme, rosemary, oregano, salt and pepper. If mushrooms are not your thing, just leave them out then add in more onions and carrots to make up the difference. Sauté all of it for about 10 minutes. Next in goes a bit of flour to lightly brown before adding in the chicken stock. Lightly browning the flour helps to get rid of the floury taste while allowing the flour to add a bit of thickening to the soup. It takes about two short minutes to lightly cook the flour. After the flour has cooked a bit, stir in the chicken stock, water, wild rice and chicken and bring it to a simmer. Lower the heat, cover and cook for at least 45 minutes, stirring occasionally. The rice should be done after 45 minutes, but be sure to check for doneness. When the rice is done, stir in the heavy cream to combine. Let it warm up a bit, then grab a spoon and have a taste. Does it need more salt or pepper? Season more as needed. Once ready, the soup can be covered and kept warm until ready to serve. Or let cool, cover and refrigerate for up to three days. I think you’ll find this Creamy Chicken Wild Rice Soup will become a favorite for years to come. Enjoy! 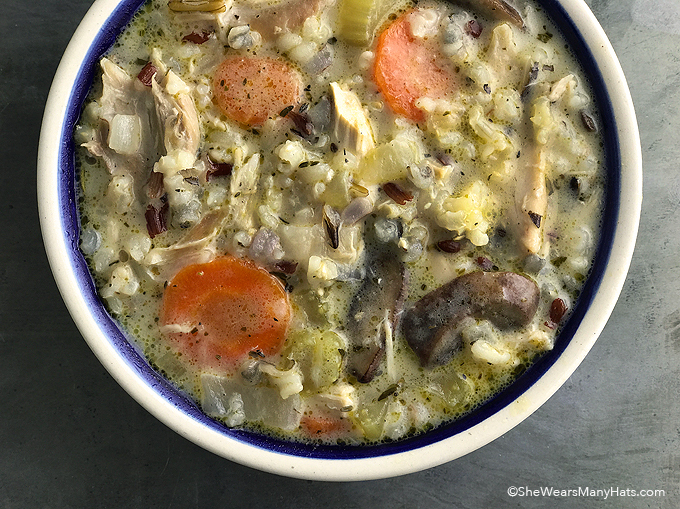 In addition to chicken and wild rice, this easy hearty soup is packed with onions, carrots, celery, mushrooms, along with a blend of herbs to create a satisfying bowl full of flavor. Heat a large stockpot over medium heat. Add olive oil. When oil slightly ripples, add onion, carrot, celery, mushrooms, garlic, thyme, rosemary, oregano, salt and pepper. Cook, stirring occasionally, for 10 minutes. Sprinkle flour over top; stir to coat vegetables. Continue to cook, stirring constantly for 2 minutes, scraping up anything that sticks to pan. Stir in chicken stock, water, wild rice and chicken. Bring to a simmer. Reduce heat to low, cover and cook, stirring occasionally for 45 minutes. Check rice for doneness. Once rice is done, stir in cream until combined. Add additional salt and pepper to taste. Cover and keep warm until ready to serve. Cool, cover and refrigerate any leftovers for up to 3 days. *When in a hurry, I like to use a plain rotisserie chicken from our local grocer, deboned, of course. When you use the rotisserie chicken to save time are you able to get 5 cups of shredded chicken from it? Or should you get two chickens? 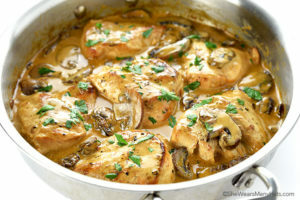 Mmmm, what a great comfort food for a cool evening!! My husband hates cooked carrots and all other orange veggies. He doesn’t even like pumpkin pie! I use greens (at the end of cooking time) or red bell pepper to try to get him the carotenes he needs, but it gets boring. Any thoughts on substitutes that this 70 y/o child won’t eave in his bowl? Hmmm … for this soup I would probably just add a bit more onion and mushrooms, along with some greens, as you mentioned. Can you use whole milk instead of heavy cream to cut back on the fat? I always use milk instead of cream when making soups. what else could you use instead of the heavy cream for those lactose intolerant? Could you use soy or almond milk? Hmmm … the heavy cream acts as a slight thickener so not sure a nut milk would do the same. With that said, I would probably try almond milk or cashew milk. I would use the unsweetened cashew milk. If you are looking for a thickener for it, add a little starch to the milk. I think ground up cashews can do that too. I use them when I make Vegetable Korma. I made This, and the soup was DELICIOUS! a nice break from your typical chicken soup. Why not blend up cooked carrots and add to the soup to hide them in there like we do for fussy children who don’t like vegetables. Perfect season for comfort soup like this one ! Pinned ! Awesome recipe! I make this every year with homemade stock and leftover Thanksgiving turkey. Always a hit! I use different kinds of rice, usually short grain brown because that’s my favorite. My husband works for Lundberg so I always have plenty of rice and look for new ways to use it. Thanks for the recipe!